Q: What is the main goal of any competition? Q: In basketball, how is a win or loss determined? Q: In basketball, how do you create points? There is no need to invent an advanced statistic to measure how many points a team scored or what the team’s record is. These two numbers are not arbitrary. They can be measured with 100% certainty. However, advanced statistics attempt to capture why the result was what it was. Enter: Dean Oliver. The first thing he recognized was the goal of basketball was not just to score as many points as possible, but to score as many points per possession. Tempo does not get in the way of reality when stats are used on a possession basis. He laid out the crucial Four Factors here. 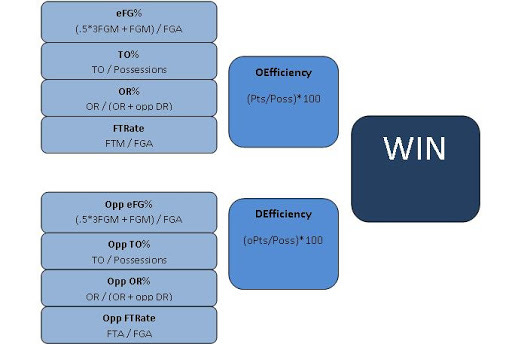 These are the four ways to be as efficient (score as many points per possession) as possible. *Note: These factors are not all equal. Shooting is the most important (about 40%), turnovers (about 25%), rebounding (about 20%), and free throws (about 15%). I challenge you to come up with another element of basketball that directly leads to points. Assists are an example of a valuable stat that is not directly represented by the Four Factors. However, an assist leads to a quality shot (or free throws) and avoids a turnover. Diving for a loose ball and other hustle plays all are apart of these factors. The above chart consists of basketball concepts. The fact that shooting is a big part of efficient scoring is nice, but we have to be able to quantify these factors. Essentially FG%, but three pointers are weighted 50% higher than two’s. Free throws attempted is better defensively, because a defense cannot control if the other teams makes their free throws. The four factors are excellent tools for evaluating basketball teams. What’s that you say? You want proof? Below is the 2009-2010 Mountain West Conference (conference games only). 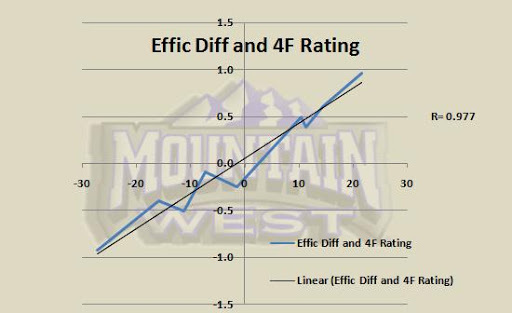 The x-axis is OEfficiency – DEfficiency. BYU was the best at +22, while Air Force was the worst at -27. The y-axis is what we call Four Factor’s Rating. The first step is standardizing all of the four factors. This makes sure unfair weighting isn’t given to any of the factors. Next, the standardized versions of the factors are multiplied by the weights mentioned earlier in the post (.4 shooting, .25 turnovers, .2 rebounding, .15 free throws). Again, BYU was the best at +1.0 and Air Force was the worst at -.9. Coincidence? I think not. Although the rankings aren’t exactly the same, the correlation between the two is .977. For any further questions on the graph or data of the specific teams in the MWC email us here. These stats simply give you a better picture of a basketball team than standard counting stats found in a standard box score. Individual stats were not touched upon here (yet), but for more information on all of this stuff email us and/or look here, here, and here.